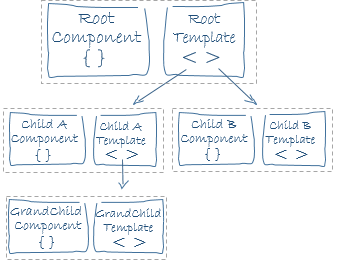 Components are used to encapsulate (repetitious) markup and tie it to behavior. Instead of separating our concerns along technological lines (HTML, CSS, JS), components tie all three of these technologies together under a unified visual element in the user interface. 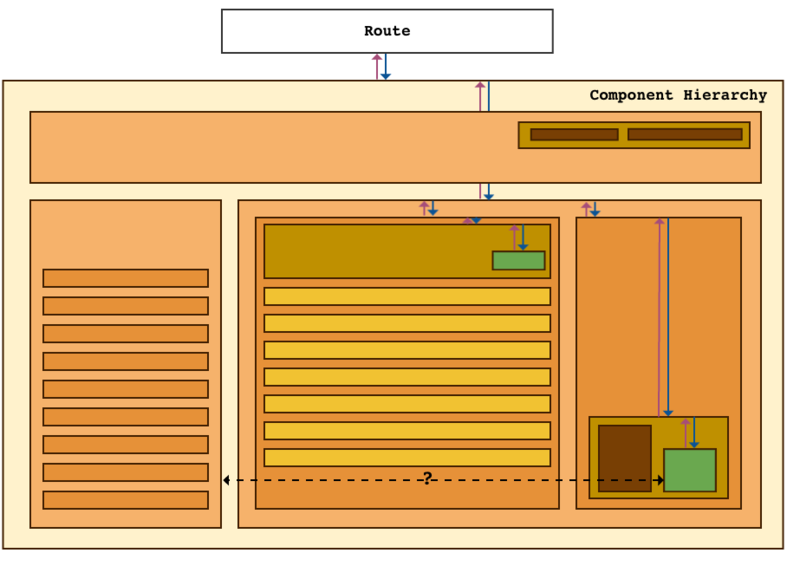 Model the user interface using components. Represent visual hierarchies with nested components. Register actions and click handlers on component objects. Pass data down from routes to components, and from components to components. Install dependencies with npm install. Let's wireframe the Shopping Lists client application interface with a focus on identifying different logical interface elements. We'll call these visual elements "components". We'll need to generate the application index route and template as a landing page. NOTE: there is no model hook for the index route because we currently don't need to pull in any data on initial page load. We already have a lists route defined with some data hard coded in, so we should be able to use this new link right away! Since the list is a visual component of our UI, we should actually pluck that out into an Ember component. What are some of the advantages of converting our list markup into a component? Besides the fact that it is less semantic to have an each block inside of an each block, our code becomes much DRY-er if we ever want to reuse this format in other parts of our application. Let's name it shopping-list to follow best practices. We wouldn't want to clash with any new HTML elements in future specs! 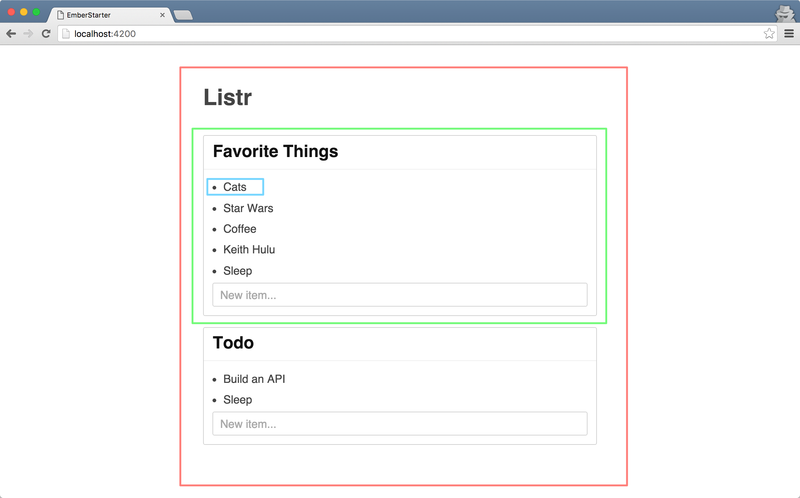 Now, we can move our previous markup to the shopping-list's template.js. After doing this, we can simply reference this component inside our lists.hbs file. However, there is one more thing we need to do in order for the reference to our component to work: We need to tell the component that we are rendering what we are passing down as a 'list'. In order to avoid confusion, I am going to rename 'list' in my each block to 'listOfItems'. I can then pass down 'listOfItems' as 'list' inside my component. Just like the list itself, each list item is an individual visual component of our UI. Create a list item component and name it shopping-list/item. Toggle display of list on header click. Let's explore Ember's classNameBindings and see if that can help us achieve this toggle. You may have noticed that when you generate a component in Ember, you get a file in a components folder in addition to the file we've been working with inside templates/components. It is in this first file that we can add classNameBindings to our component. After adding our classNameBindings and our actions, we will need to add our CSS to the class we created and attach our action to the appropriate handlebars element. After we have successfully added our styles in app/styles/shopping-list.scss, let's make sure not to forget to import this file in app/styles/app.scss. Create an action of toggleProperty that toggles a classNameBindings of listItemCompleted. This class should have a CSS style declaration that strikes through completed list items. Ember Best Practices: Actions Down, Data Up... wait what?